Really cool yet a bit creepy! This is really beautiful. You are very talented. Most are made by others but some are by me. 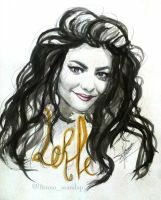 Can I use your illustration and add a Lorde quote to it? I will credit you of course and link to this page. A lot of Lorde fans will enjoy seeing it. Beau travail. Nous sommes assez proche dans l'interpretation de l'image. Lorde is the coolest ever. And this is really nicely done. I've uploaded my music box work. Please listen and check if there are any mistake, request. Thank you to approve to use such a fine picture. The shadows and hair are awesome. Well done! I'm going to upload next Sunday. Hello. I'm an amateur music box orchestrator. I often upload my works onto youtube. Now I try to create Lorde - Royals on a music box. Can I use your illustration on my music box work? These are samples of my music box work. Please refer them and reply me. Excellent. Its stylized but I get a sense that this is a real person I'm looking at. Well done on shading between the highlights in the hair to the blue in the eyes. Very well done.